Today, a Dindigul vanavasi cotton sari travelled to the historic city of Bhatinda :):). I bought this sari online from Cooptex and its such a pretty sari. Not just pretty but super comfy too. The daytime temperature soared to 45 deg Centigrade as we drove to Bhatinda but this sari kept me cool…. I have taken a decision already to only buy handlooms going forward as I realise that they are works of everyday art. The neckpiece is from Desh Maheshwari, Noida. 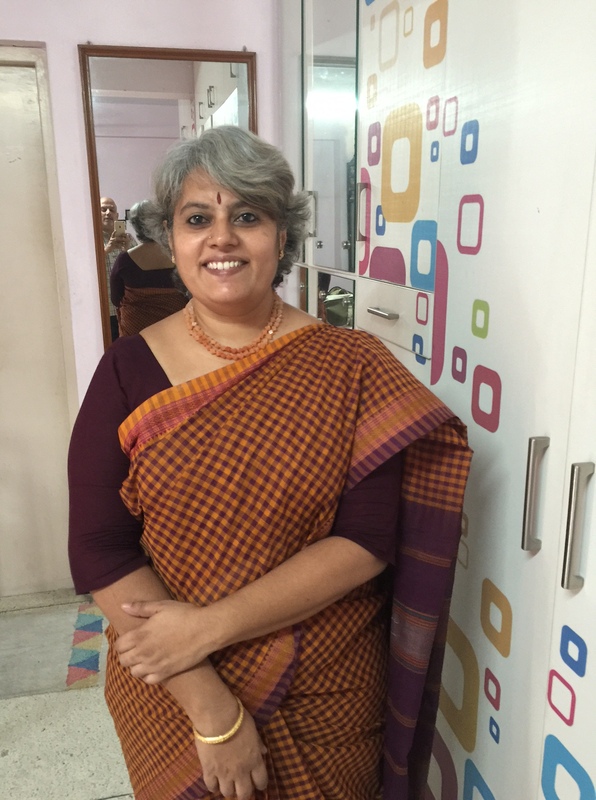 Anu Varshney, before you ask, the blouse is from my general stock and not cut from the sari 🙂 and I managed to get only four pleats … you have now got me hooked to checking how many pleats I get. I chose this pic because the photographer, Krishnan is also visible in his new shirt in the mirror. 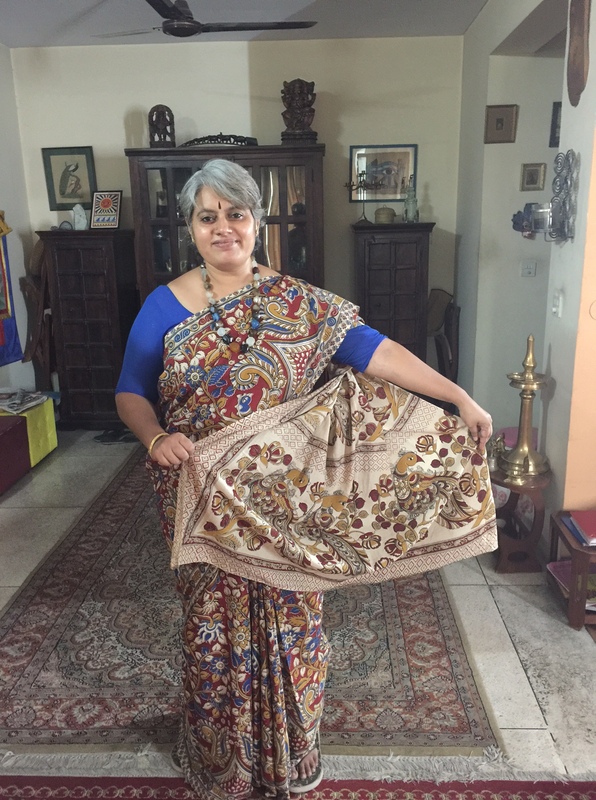 In Sept 2014, we went to Cambodia for our annual vacation and I bought the following sari from the Lepakshi showroom at the Hyderabad International airport. I knew vaguely at that time that it was a Kalamkari but I didn’t know if it was hand printed or screen printed. I still don’t. The material is cotton and it feels like good cotton. I love the print. I wore it to Mohit’s place and again yesterday when Manish came over. The neckpiece is an all time favourite from Desh Maheshwari, Noida and the blouse is a stock one, not what came with the sari. Anu, got 6 pleats on this one, but thats probably because I didn’t take out the running blouse piece. hahahaha……glad to know that I’ll be in your thoughts every time you’ll drape a saree 😀 I am big on lots and lots of pleats and long flowing pallus. I am also not taking the running BPs out of my Dindiguls. You look lovely in both sarees. I showed the checked pic to Lagnesh saying look in the mirror – how lovingly he is clicking his wife’s picture! Learn from K!!! Needless to say, L scowled. Krishnan has excellent taste. No doubt about it. Dear Desh Ji, Anu and team – thanks for this note. Your jewellery travels with me all the time. I miss you all too and will soon come visit. We are back in Gurgaon by the middle of next week.